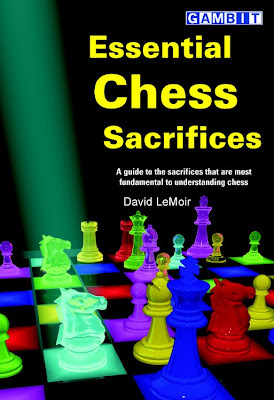 I don't always agree with the choice of bad chess book covers collected by my fellow-blogger ejh; a couple I even almost like. The ballsy swashbuckle of a Nxf7 sac, subtly blended with the sweaty glamour of disco. A rainbow of excitement beamed down at the chess board from the ceiling, like lazers from our sacrifice-loving eyes. How it reminds us all once again of that old fundamental truth, that nothing is black and white in chess. It is like a dream I had, quite literally! PS. This cover also impressed me. I have read a good deal of the book and the book is almost as good as the cover. Seems Gambit have really taken the cover of their books up a few nothces recently. It's not the colours that get my attention, it's the typography. It's awful! One thing I've noticed is that the word 'Chess' frequently appear in Gambit titles. I wonder why? Surely those interested in the topic would know already . . . maybe it's in the hope of sales to newcomers. I'm not a fan either. Personally I really think this belongs it Justin's series. I like the stonewall book cover though. What's the position, anyway? I thought it was an old Bg5 Najdorf, but I don't think it is. Looks sort of Caro-Kann-ish for black. But no f2-pawn so Blackmar-Diemer, perhaps? One thing I've noticed is that the word 'Chess' frequently appear in Gambit titles. I wonder why? It probably helps in lots of ways: page rank, library catalog search, browsing thumbnails, etc. What was I thinking of? Could it be a picture in your mind? Where does it all go, eh?